The coolest easy easter crafts for kids, that cost next to nothing or are completely free kids crafts. Take a quick look over these toddler crafts below and find one to get you started. This is one of the most popular toddler activities going. They just seem to love coloring with crayons and pencils. So let them loose with these easter coloring pages. There are easter bunnies, easter eggs and other pages just waiting to be colored in. You will need to do a little prep work to get ready for this toddler craft activity. You will need to make a small hole top and bottom of your egg. Then blow into the top hole and force out the white and the yoke. Now your egg is safe for little hands. 1.Sit the egg in an egg cup, now your toddler is ready to start making their egg beautiful. Have some poster paints to the ready and I would have some glitter and glue as well just to spice it all up a little. There are two ways to make an easter chick. One is with a toilet roll tube and the other is with some cotton wool (cotton buds will do). Take a look at the pictures to see the end results to get an idea of how they go together. 1.First job is to use a toilet roll tube for the chick body. You will need to get your toddler to paint the tube yellow. Then While it's drying you can do the following things. 3.Cut out using the orange paper for some feet, a beak and then stick on the feathers for chick wings (see picture for more info). 3. Finally when dry you need to stick on your easter chick feet, beak and feathers for wings. Oh and nearly forgot eather draw on some eyes or use as we have wobbly stick on eyes. This was all stuck together using a child friendly glue stick. We just stuffed a ball of yellow tissue paper into the top to finish the chicks head. So you and your toddler have a go at any of these easy easter crafts for kids and enjoy yourselves. 1. I would use a stiff piece of cardboard as your base (I cut out one side of a breakfast cereal packet). Also get some cotton wool to use to create some baby chicks. 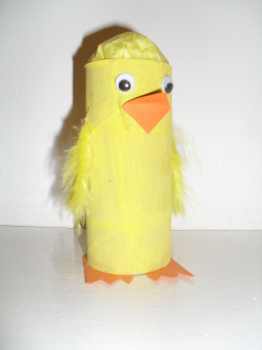 They can use yellow paper for the beak, wings and feet as in earlier easy easter crafts for kids. 2. Then rip out some pages from old magazines and catalogs with easter pictures. 3. Then give them some child friendly scissors and a stick glue and get them to stick the pictures on to the cardboard base. make sure this toddler learning activity has an easy easter for kids theme for your collage. So cut out pictures related to ideas of easter ( chicks, easter bunny, easter eggs) . 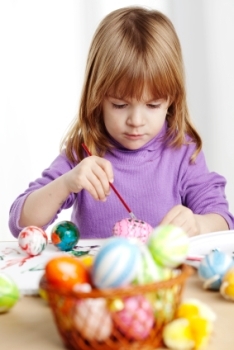 What easter craft activities do you love doing with your little one ? So why not pick up some great new ideas here and share your easy easter craft ideas here. I know other parents will thank you for it. Tell us what you and your little one like about this easy easter craft activity the most. (example title) Easter craft for kids using buttons! Your craft idea will appear on a Web page exactly the way you enter it here. You can wrap a word in square brackets to make it appear bold. For example [my east easter craft idea] would show as my easy easter craft idea on the Web page containing your story.